Due to energy security, urban heating and environmental problems (ozone layer depletion and global warming) related to mechanical cooling as well as increasing demand of indoor environmental control, the passive cooling methods have gained increasing interest. 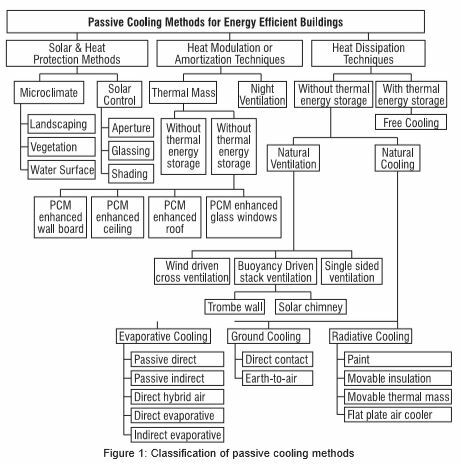 Various passive cooling techniques are shown in figure 1. Natural ventilation is simple and very old technique but suffers from many drawbacks such as overheating problem, wind direction dependency, etc. To overcome these, the free cooling methods have been introduced and considered as a potential tool for day-night cooling applications. Such systems require the energy supply only for fan operation and storage unit, which makes it more advantageous over mechanical cooling. Storage unit incorporates PCM, where cold is stored from ambient air during night, and it is released to the indoor ambient during the hottest hours of the day. PCMs can store a large amount of cold and phase change occurs at a constant temperature. Hence, PCM based free cooling gained much more attention recently. • Compatibility with materials of construction. 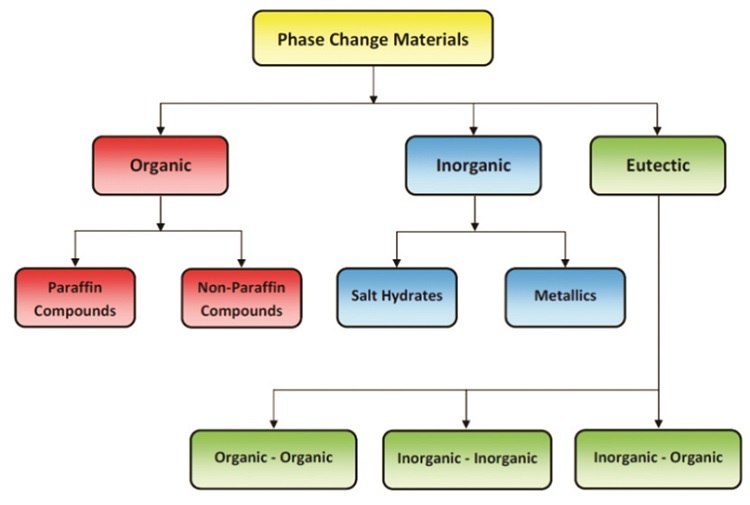 Phase change materials can be divided into different subcategories based on their chemical composition. Three groups are: (i) organic compounds, (ii) inorganic compounds and (iii) inorganic eutectics or eutectic mixtures (Figure 2). Each group has its typical ranges of melting temperature and melting enthalpy. Organic PCMs are classified as paraffin and non-paraffin. Paraffin PCMs are characterised by their ability to melt and freeze many times without phase segregation and degradation of their latent heat of fusion. Non-paraffin PCMs are characterised by their varied properties; each of these materials has its own properties. These are subdivided into fatty acids and other non-paraffin organic. Fatty acids have high values of latent heat of fusion and the ability of many cycling of melting and freezing with no supercooling. Inorganic PCMs are classified as salt hydrates and metallics. Salt hydrates consist of a salt and water that combine in a crystalline matrix when solidifies. There are many different salt hydrates having melting temperature ranges between 15°C – 117°C. Salt hydrates are considered as the most important group of PCMs for application in latent thermal energy storage systems. Metallics include the low melting metals and metal eutectics. Comparison of organic and inorganic phase change materials are summarised in table 1. The eutectics consist of two or more components where each of them melts and freezes congruently forming a mixture of a component during crystallisation process. Usually, eutectics melt and freeze without segregation. During melting process, both components liquefy at the same time without possibility of separation. This occurs during the night when the outdoor air temperature is lower than room temperature (Figure 3a). Cool outdoor air flows through the PCM and absorbs heat from the liquid PCM. The PCM then begins to solidify at a specific temperature. This process stops when the ambient temperature is almost equal to that of the solid PCM. Cold stored in the PCM is released when the room temperature increases beyond comfortable levels (Figure 3b). The solid PCM absorbs heat from the hot indoor air. The temperature of the indoor air is reduced as a result of flowing through the PCM unit. This cooled air is circulated into the interior of the building. The PCM starts to melt as it absorbs heat from the air while remaining at a constant temperature. If the melting temperature of the PCMs is in the middle of the diurnal extreme temperatures, then an equal temperature difference is available for charging and discharging. The ambient temperature of a place is dependent on the seasonal climate and its geographical location. The free cooling concept is site specific and climatic dependent. Free cooling is suitable for places where the diurnal temperature variation (difference between the maximum and minimum temperature of the place), is at least 15°C. The effectiveness of free cooling does not depend on the average temperature of a place, but it is a strong function of the amplitude of the ambient temperature swing. 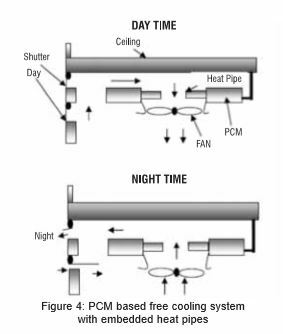 There are several options where and how PCMs can be used to meet the cooling requirements. Many research and development studies have been conducted on PCM based free cooling, which includes mainly the selection of PCM, system configuration and heat transfer improvement. PCM selection is governed by many factors (chemical, physical, thermodynamic and economic properties), which have discussed in the previous section. Heat transfer improvement includes use of fines, multiple layers of PCM, nano particles in PCM, flow turbulence, etc. Three important system configurations are discussed below. A module of PCM based free cooling with heat pipes embedded in a PCM is shown in Figure 4. It is ceiling-mounted with a fan to throw air over the exposed ends of heat pipes. The other end of the heat pipes is in a PCM storage module. During the day, the warm air generated in the room is cooled by the PCM i.e. heat is transferred to the PCM. During the night, the fan is reversed and the shutters are opened such that cool air from the outside passes over the heat pipes and extracts heat from the PCM. The cycle is then repeated next day. The heat pipes avoid the need for complex heat exchange geometries on the surface of the PCM exposed to the air, and the system is easily retrofitted. The heat transfer rate could be improved, and the phase change time will be shortened by using the heat pipe inside the PCM. 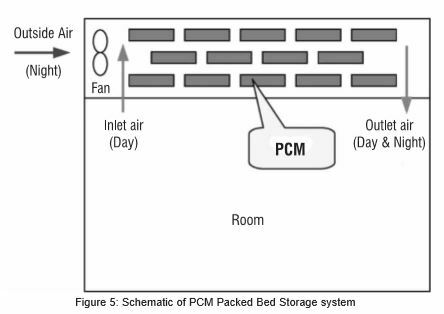 Night ventilation system with PCM Packed Bed Storage (Figure 5) can be used for increasing building’s energy efficiency. The most important component is the Latent Heat Thermal Energy Storage system including phase change material package bed and the air duct among the PCM capsules. During the night, the cold air from outside is blown through the storage system which charges the system with cold. In the daytime, cold stored in PCM is released to the air which cycles between the storage system and the room. Enough heat transfer area can be obtained by adjusting the ratio of the surface area to the volume of the PCM capsule. PCM has high energy density and the latent heat transfer process is approximately an isothermal process, which may decrease the temperature variation of building materials so that the temperature difference utilisation efficiency can be enhanced whether in cool charging process or cool discharging process. By adjusting the melting point of PCM, the cool charging temperature difference can be enlarged and the time that can charge cool to PCM can be extended at night so that more natural cool resource at night can be stored. With mechanical ventilation, enough air flow rate can be obtained. In additional, the air flow rate can be controlled to meet different cooling load demand at daytime. This system has great potential in the field of energy efficiency building with enhanced thermal comfort level of indoor environment. 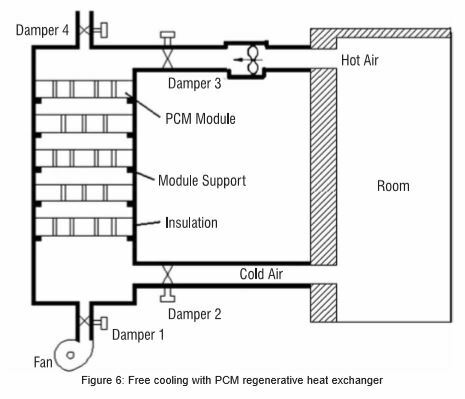 The free cooling system with PCM regenerative heat exchanger is shown in figure 6. The set up consists of a series of bulk cylindrical disc modules containing PCM on the shell side and the passages for flow of air through the tubes. These modules are stacked one over other with air spacers in between each module. The cool air available at the early morning is made to pass through the PCM regenerative heat exchanger and this cool energy is stored by freezing the PCM. The stored cool energy is retrieved during day time for space cooling. During the night time when dampers 2 and 3 are in close position and 1 and 4 are in open position, the cool energy available in the atmospheric air is made to pass through the modular heat exchangers using a fan or blower. As the cold air is passing through the PCM regenerative heat exchanger, the PCM in the modules will freeze and store its cool energy. A fan is used for air circulation during night time and the dampers are adjusted to control the flow rate of air. During the day time when the dampers 2 and 3 are in open position and 1 and 4 are in closed position, the hot air from the room goes to the PCM module by natural circulation or small capacity fan and the PCM releases the stored cool energy to the room at a slower rate to cater the cooling need throughout the day. Phase change material should be selected such that the melting or solidification temperature lies in the middle of diurnal temperature variation of the ambient air. The applicability of the PCM based free cooling of the buildings depends mainly on the diurnal temperature range or the amplitude of the ambient air temperature swing rather than average ambient temperature. Therefore, this system performs efficiently in the climatic conditions where the diurnal temperature range is between 12 and 15oC. For climates where the diurnal temperature range is less, this system will require a careful design consideration including selection of appropriate PCM and appropriate PCM capsulation. Free cooling provides a significant economic benefit because of shifting peak load time of electricity usage and reducing peak air conditioning demand (reducing domestic electric energy consumption during peak period loads). About 17 per cent of the total implementation cost relates to the storage materials (PCMs). Although the free cooling system needs additional investment of 9 per cent, with payback over a period of three to four years, it consumes almost nine times less electrical power than conventional split-type airconditioning unit. Replacing a conventional air conditioning unit with a free cooling system could reduce CO2 emissions by 430 tons per year. Despite a large number of researches, the real case applications documenting the potential and behaviour of PCMs in real operation conditions are quite rare and the technology has not yet been fully commercialised. 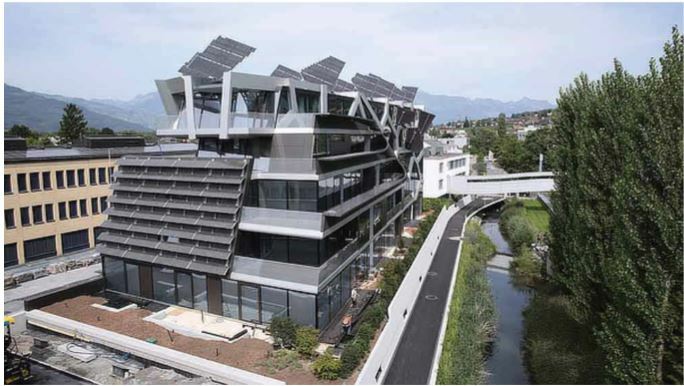 The barrier to the PCM application in actual buildings may be attributed to their major drawbacks such as segregation, supercooling, low thermal conductivity, high cost and to the limited number of PCM manufacturers available around the world. European cities are the most geographical locations where PCMs with free cooling was implemented. This technology can be also promising option in India for locations with diurnal temperature variation. Finally, the concept of free cooling using PCM energy storage is still under development and more research is needed to convey the concept from the theoretical and experimental stage to the real implementation phase.